What I've been up to: 5 Year Anniversary! This month, April 2011, marks the fifth anniversary of The Benefits Of Positive Thinking - I can't believe it's been five years already! I wrote an update to the About Me page, reflecting on these five years. Check it out at April 2011 Update. This past month has come full of challenges in my personal life - all of them pointing at the need to keep grounded and keep focused. I have seen many of my friends going through similar waves lately too; it seems to me we're all at the point of breakthrough to reach something new, while discarding old patterns of thought and behaviour which no longer serve us. So joining the fact that we can all do with some more support, and that I wanted to do something special to celebrate the fifth anniversary of TBOPT, I have decided to offer a 20% discount for an Empowered Experience coaching session, valid until 15 May 2011. All you have to do when you contact me to book your session is type in the word 'DARE' in the box for the question "Do you have a promotional code?". Your session does not need to take place before 15 May, but you do need to book it before 15 May to benefit from the discount. I look forward to hearing from you! In order to de-stress and connect with the core of myself I have been going for a walk through the streets of London after work. I love this city, and I love finding funny or interesting details at the turn of each corner. 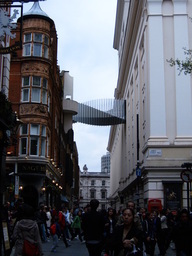 See a picture of the contrast of architecture, next to Covent Garden. Has it ever happened to you that you work towards achieving something, and when you're very close to actually having it (or you even get to have it for a little while), something else happens and it seems to slip through your fingers? Lately I have experienced a few of these scenarios in different areas of my life. I have given it some thought, and I have spoken about it with some people, in search for an explanation. The conclusion I reach is that there is a certain pattern there, which has been with most of us for most of our lives, and which can become an obstacle to actually getting what we want if we leave it unchecked. This pattern is called Deserving. Do you truly believe that you deserve to have what you want? Do you accept that you deserve to be loved, to receive money, to be always provided for, to experience your life in peace, to live in full health? As I asked myself these questions, my first answer showed no doubt: "Of course I do! Why wouldn't I?". Then I looked closely at my childhood and my experience of life so far - or rather, my experience of life until I started to deliberately choose how I want to live. I was quite surprised to find that I do believe I deserve things... as long as I give or do something in exchange. "You've got to work hard to achieve what you want"; "If you want something, it costs you something"; "Nothing is free"; "Life is not easy". These are sentences that I heard over and over as I was growing up. Not only my family, but also the society in which I grew up seemed to have these statements as a base. Do you find that you have to justify receiving something? "I can accept this money because I have worked hard for it"; "I can accept this gift because I've done a lot for this person". This underlying pattern of deserving and of having to justify getting what we want has quite a lot to do with the problems we encounter when we're close to achieving goals. Because you see, if down deep we believe that we don't really deserve something, we will subconsciously create all sorts of situations or behaviours which will manifest in some type of delay or problem in getting what we want. The very first step to start deconstructing a belief about not deserving consists in challenging it. You can pick any area of your life in which you would like to experience more abundance (love, money, health, time...) and ask yourself, "Do I feel that I deserve more of this good thing? "; if not, why not? Where, when and how did you learn that you did not deserve it? As you explore your thoughts and emotions about deserving, you will start embodying the knowledge that, in fact, you do deserve to receive an abundance of all good things - without having to do anything in exchange. Now such a deep-seated belief will not disappear from one day to the next, but as you explore it, all related thoughts which don't serve you will start falling away. Here is for our realizing and accepting that we deserve an abundance of all good things, and for allowing them to come into our lives more and more every day! Every month I receive emails from readers - some of them contain questions or comments, and some of them are contributions, such as a positive story, an article or a tip. "I think anyone that sits and gives thanks when they have things like good health taking away is just fooling themselves. So.... you tell me how to be thankful for rotten health, not being able to work." I have personally been there - I have at times felt skeptical about some of the techniques I explain on the web site - and it was usually during my darkest hours. See, it took me a while to get that that which I focus on grows. My health is not perfect - I have had back problems since I was a kid - but some time ago I made a conscious decision to focus on what is great about my health, while at the same time fully believing that some day my back would be in perfect condition. What I have learned over the years is that when I focus on what's wrong, I feel bad, and I make it a bigger problem. When I completely ignore what's wrong and focus on what's working, my life seems to get better and easier in all areas. I know that many people would say 'How can you ignore what's wrong? How are you going to fix it if you don't deal with it?' - however I'm only telling you what works for me. Now I don't know your specific problem, but what I can say to you is that feeling good improves all areas of our lives - so if you can focus on what makes you feel good and the things you are thankful for for most of your time I know that you will start seeing changes for the better. I wish this is helpful - thank you so much for your contribution :-)"
I appreciated that Mike contributed with his comment, because it's a common point of view which I also held some time ago. You can read Mike's comment on its page at "Yea... sure". Five Gateways: this is a very interesting documentary about the stages of letting go of our 'small selves' and communing with the energy that permeates everything. Well worth watching! 'Island meets city': a lighthearted and fun blog for those of you in your 20s mainly, which also includes useful advice about health, love, and music, among a lot more. Refreshing! 'High on happiness': this is the blog of my friend Susan, and I'm bringing it to your attention because she just has this way of noticing and pointing at all the beautiful things in life that you cannot help but feel good. Mind you, Susan has had a small accident which resulted in one of her arm bones broken in three places, so she won't be posting for a while - but do go through the archives, because you will find inspiration and love in buckets - together with some of the beautiful pictures she takes. While you're at it, please send her healing thoughts! Thankful for... the organic shop. There is an organic shop called Planet Organic just ten minutes away from my day job; I love the tasty food, the smooth lattes, the refreshing juices... It feels healthy, and it feels good! What are you thankful for? Share your gratitude on this page and read what others are thankful for! Thank you for reading this issue of Dare To Play It Big, the free positive thinking newsletter of The Benefits Of Positive Thinking. Care to send me your thoughts about this issue's topics? Email me and let me know! If you enjoyed this newsletter, please pass it along to your friends, family and colleagues, or send them to the Dare To Play It Big sign up page. I thank you in advance. "Our deepest fear is not that we are inadequate. Our deepest fear is that we are powerful beyond measure. It is our light, not our darkness, that frightens us most. We ask ourselves, 'Who am I to be brilliant, gorgeous, talented, and famous?' Actually, who are you not to be?" Cristina Diaz © Copyright 2006-2012. All rights reserved. Sign Up For Free Below Right Now!